Hair issues always have flagged my life. I have Psoriasis and it's hereditary, meaning that dying my hair blonde can trigger a flare up, and so can stress! When the team behind Roots got in touch I was intrigued. 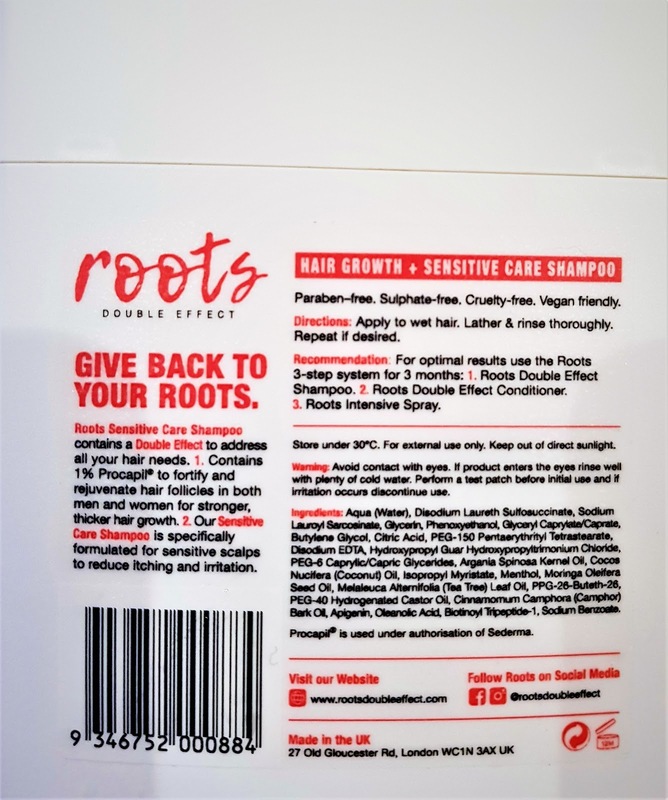 Roots takes pride in being the first brand to solve all your hair issues in one carefully curated product. 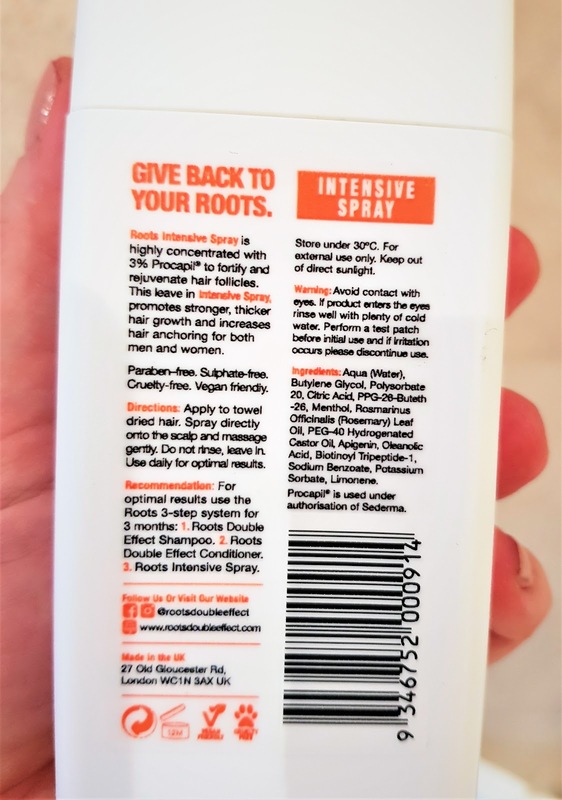 Available to buy in Superdrug ''Here" Roots offers something for every hair concern, and with 1.6 billion people suffering with hair loss - Roots can help rebuild your hair, and your confidence. Over 65%* of all hair loss product users are unhappy with the available treatments. The reason? Products that don’t deliver, harsh ingredients that cause irritation, overly priced treatments and empty promises... So we went on a quest to find the latest technology in hair strengthening products, looking into naturally-derived ingredients that boosted hair growth and strengthen the follicles. That’s how we came into Procapil®. Crafted in France, Procapil® is a naturally-derived active ingredient that noticeably increases hair growth by strengthening the follicles while preventing hair loss. Tested in females and males, Procapil® has shown to increase hair growth up to 88% in four months. We took this active ingredient and paired it with a sumptuous texture and a natural tea tree scent. The result? An effective, affordable and easy to use portfolio of products targeting each hair necessity. 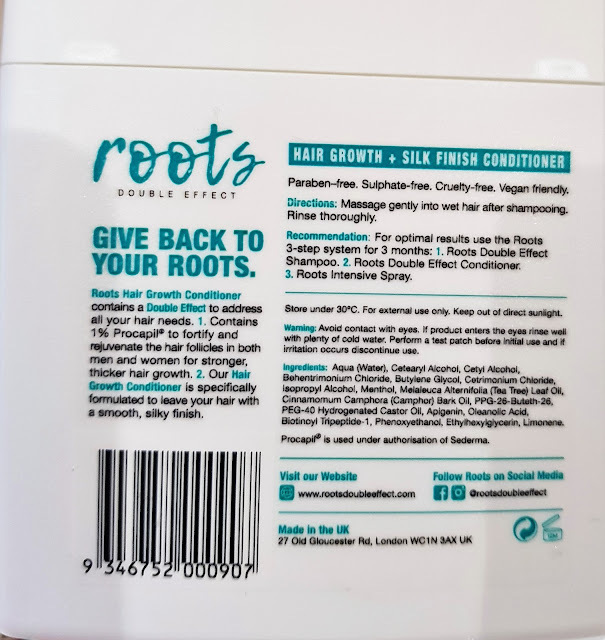 Because we each have different needs, Roots™ addresses two hair issues in one product. Do you suffer from dandruff? Have oily hair? 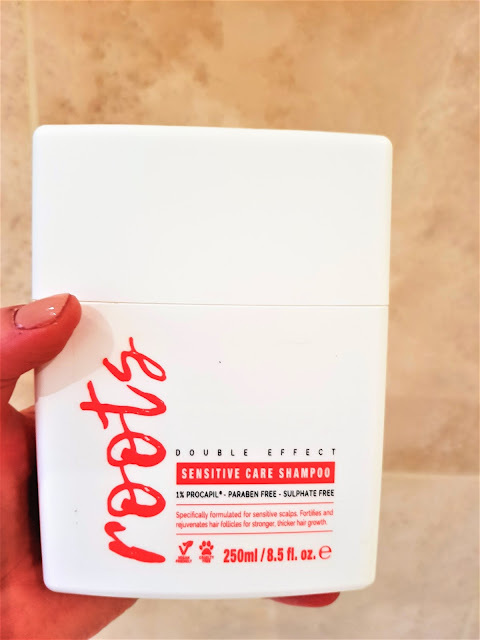 A sensitive scalp that gets easily irritated? 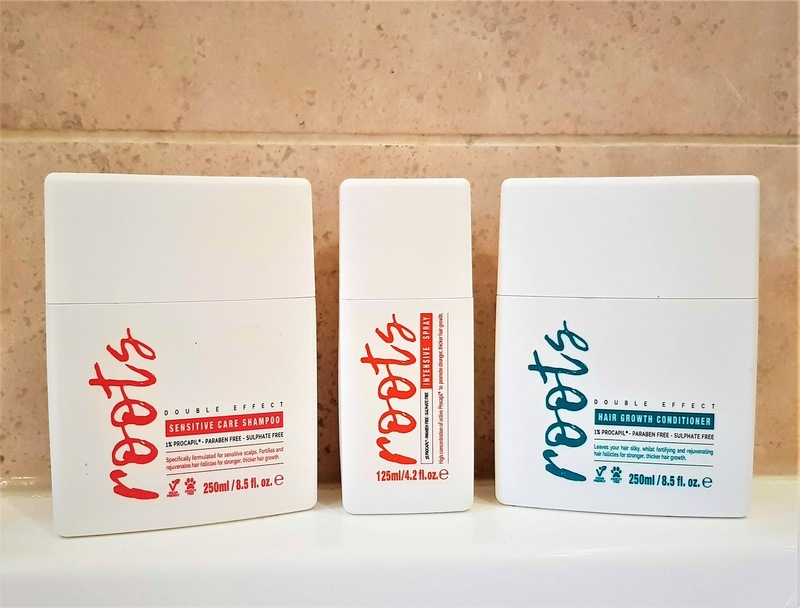 Now you won’t have to choose between gorgeous, strong and voluminous hair and a healthy scalp. 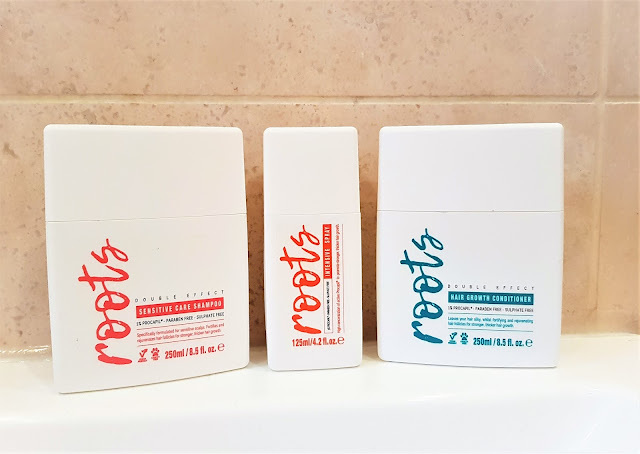 Get instant beautiful hair while Roots™ works on your scalp to strengthen your follicles and promote faster growing hair with every wash.
Want to make those locks grow quicker? Try our Intensive Treatment Spray. 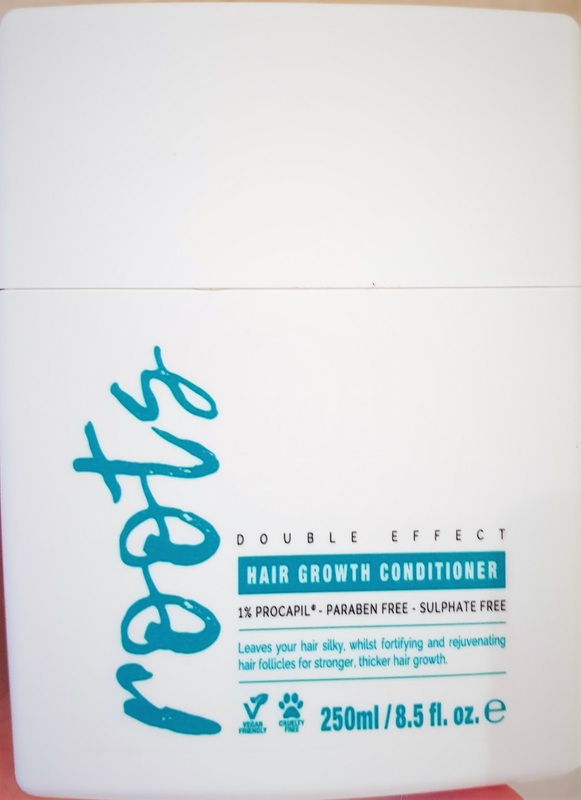 With the highest concentration of Procapil® at 3%, it boosts hair growth with every application. Spray it directly into your scalp daily and see your hair grow faster than ever before. Wait thats not even the best part... Roots™ Intensive Spray won’t mess with your hairdo so you can style it as you like. Give back to your Roots. There are so many hair brands on the market, but to have a brand aiming for treating your hair and giving it body and shine all mixed together. Roots are cruelty free, Paraben Free, Vegan friendly, and dermatologically tested. Features - Paraben free, sulphate free. Vegan friendly, cruelty free and naturally derived ingredients. I like the square packaging of the Roots Range. It's unique to any other brand out there, it's sophisticated in its look and it stacks really neatly on the side of your bath, or on your bathroom shelf! Roots Intensive Spray - is highly concentrated with 3% Procapil® to fortify and rejuvenate hair follicles. 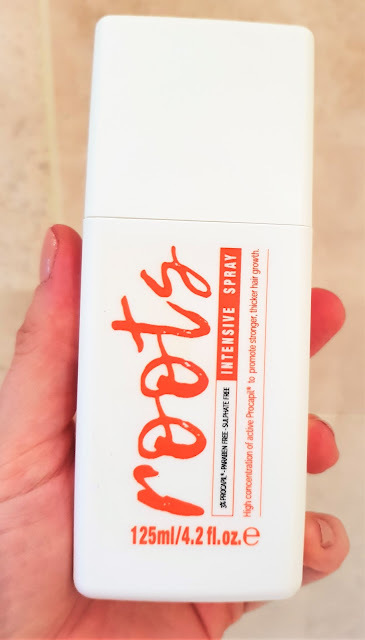 This leave in Intensive Spray, promotes stronger, thicker hair growth and increases hair anchoring for both men and women. 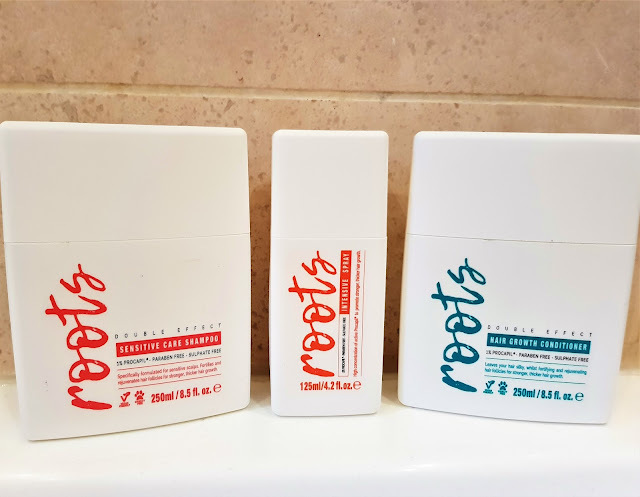 After using the 3 Roots products for about 3 weeks, I did notice more baby hairs growing and my scalp being slightly less irritated. I would say that to see lasting results from the Procapil ingredients long term use will enable you to gauge if the product is definitely working for you. 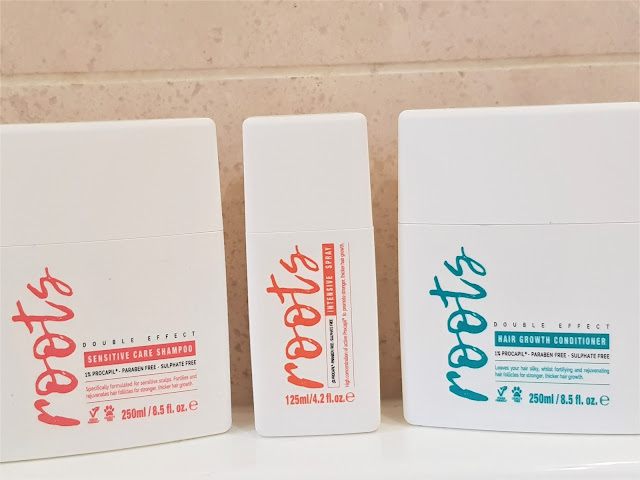 I didn't mind the smell of the Roots range, I liked the packaging and the concept and it's definately a range that I will keep using, and hopes that the Shampoo will start to ease my Psoriasis symptoms somewhat. 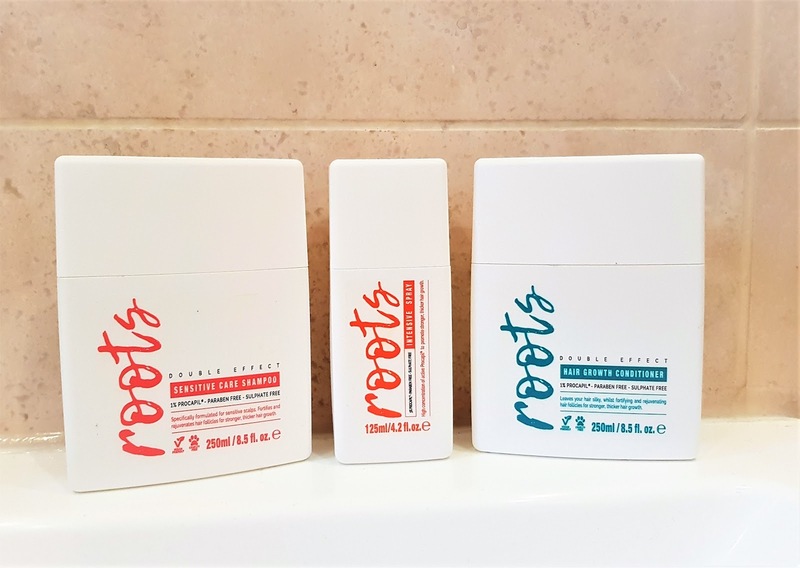 Have you tried anything from the Roots brand before?